Right now, harvest might seem far away. But in just a few short weeks, combines will be rolling, grain wagons hauling and grain bins filling. The way you dry and store your grain will greatly impact your ability to sell when the market is right—make sure you have a plan. At the end of the season when corn and soybeans stand in fields and dry down, they’re prey to many pathogens, insects and weather conditions. If you want to avoid those threats harvest grain early—make sure you have a plan for drying. Running grain through a dryer, instead of relying on field- or bin-drying, is faster and can be safer for grain in long-term storage. Dryers get grain to a precise moisture content and increase uniformity in every kernel. Uniform moisture helps decrease your risk of molds such as aflatoxin and can help reduce your risk of “hot spots” in bins. “If you’re harvesting at moisture levels greater than 25%, be aware that your dryer’s capacity will be less than typical,” says Joe Shulfer, president of Mathews Company grain dryer manufacturer in based in Crystal Lake, Ill. When you set up your dryer for the first time, company representatives can help walk you through how it all works and how to account for higher moisture content. Be sure to set your expectations for speed accordingly if grain comes in wet this year. If it’s dry in your area and stays that way, dryers can still help maintain profitability. If grain simply dries down in the field it could endure stalk rot, shattering, wind damage or other ailments that lead to kernel or ear drop in the field. Dryers give you the opportunity to take it out at a safer, higher moisture level. With improved technology you can manage dryers from your phone, so harvest and other activities aren’t interrupted. 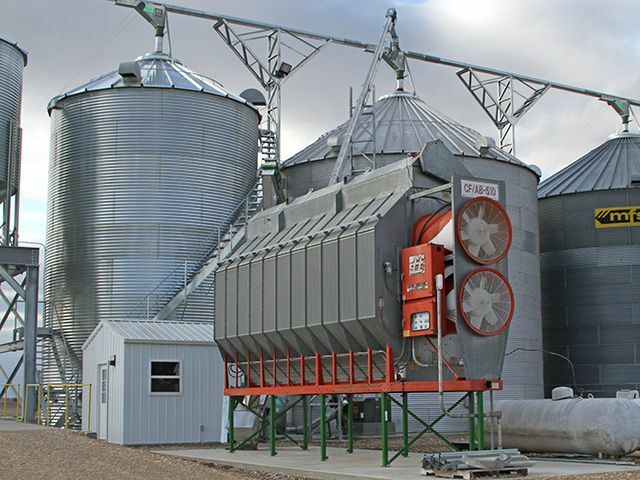 Just like grain bin technology has improved, so have dryers and sensors and monitors allow you to adjust on the fly. With new systems, you can see and control what your dryer is doing from a phone or tablet. In many cases it’s not too late to install a dryer system on-farm, if you’re interested, manufacturers just need about three weeks to get it on your farm.